If you’re anything like me, then one day for Irish eats just isn’t enough. 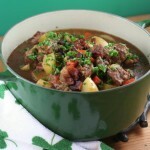 Luckily, I’ve overstocked on the St. Patty’s staples enough to make several meals, and a dutch oven Irish stew is definitely one of them. 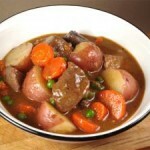 Stews are a mainstay Irish comfort food. Traditionally, they’re made with potatoes, onions, parsley, and sometimes carrots. For protein, lamb can be used, but mutton is usually better because the meat is tougher, fattier, and lends more to the dish. But just because there’s a tradition, doesn’t mean that there isn’t any leeway. 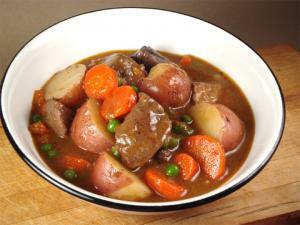 For centuries, Irish stews have been an expression of the cook. Ingredients like turnips and pearl barley make an appearance, while purists turn up their noses at anything more complex than mutton, potatoes, onions, and water. 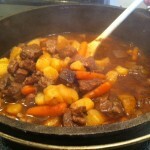 The stew is always cooked slowly—expect to be simmering and boiling for up to two hours. 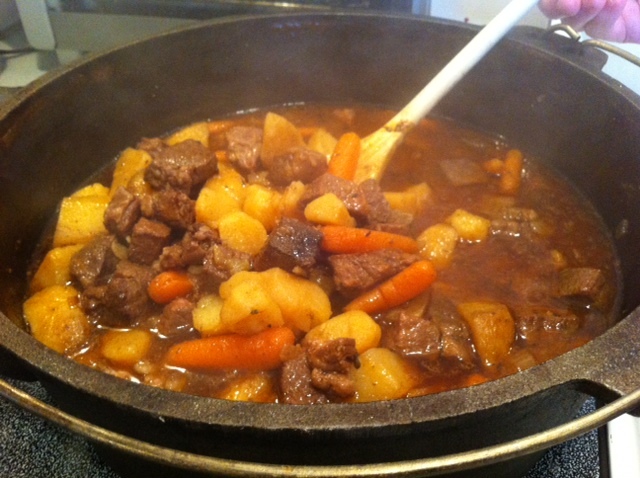 As a cooking method, stewing has been a part of human civilization for many centuries. The Gaels of Ireland, however, didn’t have access to a cauldron until after the Celts had invaded and brought them in, after the 7th century BC. Stews back then were often made with goat and root vegetables, and the ingredients and cooking methods haven’t changed materially since then. The biggest addition to the Irish stew in terms of ingredients was the potato, which came from South America in the sixteenth century. Open fire kitchens had been around for many years, even well into the industrial revolution. When the British began to produce dutch ovens, they became a valuable addition to most kitchens and a natural implement for Irish stews. If you’re going to make this stew, bake some dutch oven soda bread alongside, and you’ll be close to having an authentically cooked Irish meal. This is the sort of recipe that you get a craving for—hearty, filling, and with a broth that coats your lips. Heat olive oil in a 4 ½ qt enamel dutch oven, over medium-high heat. Add the stewing meet and saute it until it browns on all sides. Add garlic and sauté another minute. Add beef stock, thyme, tomato paste, sugar, Worcestshire sauce beer, red wine and bay leaves. Stir to combine and bring the whole thing to a boil. Reduce heat to medium-low, then cover and simmer for an hour. Stir occasionally. While the meat and stock is simmering, melt butter in an enamel cast iron 11 Inch Skillet over medium heat. Add carrots, onion, and potatoes. Saute vegetables until golden and set them aside. After the stew has been cooking for an hour, add the golden vegetables. Simmer uncovered until both the vegetables and the stew meat are fork tender. Discard bay leaves and add Salt and pepper to taste, then sprinkle in the parsley. Now, that’s one way to clean out the pantry! If you’ve tried this recipe, let us know what you think in the comments below! Or, if you’re all Irish’d- out (as if! 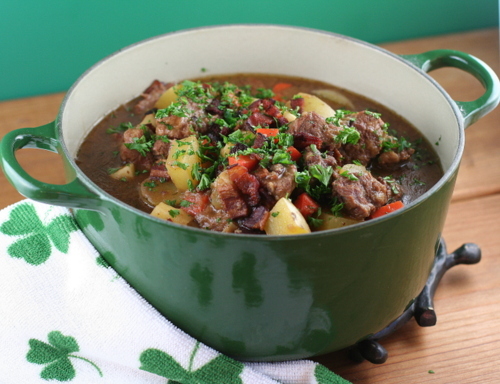 ), tell us all about what you were eating and drinking for St. Patrick’s day! Thanks to Big Oven for posting a great recipe that’s the basis for this variant!